Timothy A. 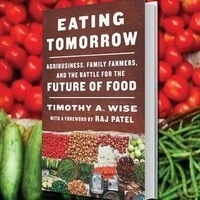 Wise launches his new book, Eating Tomorrow: Agribusiness, Family Farmers, and the Battle for the Future of Food, with a public talk and reading, along with commentary and an on-stage conversation with food sovereignty and environmental activist Vandana Shiva and food journalist Mark Bittman. Bea Banu, Chair of the Food Studies Program at The New School, will provide the opening remarks. Free admission/unreserved seating. Copies of Eating Tomorrow will be available for sale at the event. The speakers will be signing copies of their books after the panel discussion. Co-sponsored by The New Press, the Small Planet Institute, the Food Studies Program at The New School. Mark Bittman is the author of 20 acclaimed books, including the How to Cook Everything series. He wrote for the New York Times for more than two decades, and became the country’s first food-focused Op-Ed columnist for a major news publication. Vandana Shiva is an Indian scholar, environmental activist, food sovereignty advocate, and alter-globalization author. Currently based in Delhi, she has authored more than twenty books, including Who Really Feeds the World? Timothy A. Wise directs the Land and Food Rights Program at the Small Planet Institute and is a senior research fellow at Tuft's University's Global Development and Environment Institute.